Dog Ramps vs Dog Stairs and Dog Steps: How Do You Decide? Home Dog Supplies Dog Ramps vs Dog Stairs and Dog Steps: How Do You Decide? So you're in the market for either pet stairs, steps or ramps. You have a reason to buy one, but aren't sure which option fits your dog or your home better. You're not alone, because most dog owners are often confused about the differences between dog ramps, dog stairs and dog steps. Why do pet owners even need stairs or ramps for dogs? When it comes to joint problems in dogs, dog stairs, steps or ramps are always a good idea. Several studies have found that jumping or even climbing steep surface places a lot of stress on the dog's joints because they're not designed to sustain it (unlike humans). Further, research also found that climbs and jumps increase likelihood of arthritis. Dogs who are more active and spend a lot of time jumping up and down from elevated surfaces are simply much more likely to experience joint pain, agility issues or develop arthritis later in their lives. On a different note, using dog ramps or steps can also help us, dog owners. The most common example is pet owners with SUVs and medium sized dogs. If your dog cannot get into the back of your car, it means you have to pick him up and help him into the vehicle. Doing so on a regular basis places a lot of unnecessary stress on your back and joints. Samantha has done a wonderful video explaining how to help a dog into vehicle, why dog ramps are helpful for everybody and how to avoid hurting yourself and your dog. With that said, how does a pet owner decide between dog ramps or steps/stairs? which one is the best fit for you and your Fido? Every pet and each situation is different, and therefore there is no basic and simple solution for selecting either pet steps, stairs or a pet ramp. With so many different options of dog steps and stairs available, you'll need to consider several different factors, which I'm going to list for you below. Pet stairs are the most commonly chosen option for dogs that are familiar with and physically capable of handling “people” stairs. But if you pup has never climbed a set of stairs, and has a tough time with understanding how to use them (it's much more common than you think), then you should either spend time teaching your dog how to use stairs – which is highly recommended – or opt for a dog ramp instead. A common question: what's the difference between dog steps and dog stairs? Essentially, there is no difference. The two are used interchangeably when it comes time to shop for a set of pet stairs or steps, and we'll refer to both throughout this article. There are two different designs of pet stairs, one of them being more mobile and easy to move, but not as sturdy. The more mobile type of pet stairs for dogs will resemble a ladder, like these ones from Solvit. How to choose the right type of dog steps/stairs? Dog stairs come in several different sizes and heights to fit every breed (the overall height and the height of each step), and a number of steps (usually from 2 to 4). Picking the right size is key. It is vital that you know what size of dog stairs will be the best fit for your pet, or you could end up making it physically harder on your Fido to climb those stairs than it would be simply to jump up into the car or onto a bed. Do your research to find out the exact measurement of pet stairs you're about to purchase. Measure your dog accurately and then measure all the furniture, vehicles and other heightened surfaces where you believe your Fido will be using those pet stairs on. If you need help on how to measure your dog for a perfect set of stairs (or a ramp) and how to pick the right type, watch this quick video guide from Samantha. It is essential to note the rise or height of each step. For example, regular outdoor or indoor pet stairs have individual step rises that measure approximately 6.5 to 7.5 inches in height. Therefore, the dog steps you choose should be of a similar size. Another thing to consider is the depth of each step. Your dog will prefer deep and roomy steps because they make it easy for him to climb and maneuver while walking up or down (and some dogs simply fear narrow steps). A good rule of thumb is to be sure that each step has a depth form 10 to 12 inches for the easiest usage. You also want to be conscious of the material your pet steps are made of. If you have a small breed dog that is lightweight, foam stairs may be a good option for him. Foam steps are also good for small and medium arthritic dogs or those with joint pain. Important: Always make sure to check the weight limit of any pet stairs for your dog before you purchase them. However, if your large breed dog weighs over 100 pounds, foam steps certainly won't do the trick because they won't handle the weight nor will they inspire confidence in your dog. This is when you go after dog stairs made from plastic, wood, or metal. After doing some research, I found that the most common reason many dog steps and stairs are returned on Amazon is because the owners didn't read the description on the product page about their measurements and/or didn't measure their dog (correctly). Pros and cons of using dog steps/stairs over dog ramps? One of the major advantages dog steps and stairs have over pet ramps is that they often take up less space when in use, while both are designed for pets to reach the same height. The way dog ramps designed, they are simply not very ergonomic when extended, nor can they be (however, some dog ramps are easier to store than pet steps). Pet steps can be placed alongside a bed or chair and are ideal for tight or limited spaces. If your dog is young or middle-aged and in good health, steps offer a great way to move up and down safely from a variety of furnishings in almost any area of a house or apartment without taking up as much space as dog ramps do. You can also use dog stairs outside your home, as they can be used next to decks, vehicles or doors. While majority of pet owners can find the right size and type of pet stairs for their dog, some may like to have a special size. In that case, some companies are willing to customize a set of pet stairs according your specifications. Simply call the manufacturer with the dimensions in order to obtain a quote and compare it with other dealers who offer customization too. Finally, high quality dog stairs are almost always cheaper than high quality dog ramps due to cheaper quality builds and less material used, so they're perfect for owners on a budget. It's true that there are dog ramps that are priced same as pet stairs, but I would never trust any of those (if you've seen them live, you know what I mean). As for disadvantages when comparing pet stairs and steps to dog ramps, there are a few of those as well, both of which can be a deal breaker for some dog owners. In fact, there are three very important differences between dog steps and stairs. First, when everything is set up, locked and secured, most dog steps are not as reliable and sturdy as dog ramps. If you secure your dog ramp properly, it will always be much sturdier and immovable than a set of dog stairs. Second, dog ramps are always better for arthritic dogs than pet stairs. Even though pet stairs are better for your dog than simply jumping up and down from elevated surfaces, they still require some effort and stress the dog's joints. Dog ramps, on the other hand, allow your Fido walk the ramp with significantly less stress placed on the joints. Finally, some dogs simply prefer ramps over steps because they don't seem to trust small and iffy, narrow looking set of pet stairs (and I can certainly understand them). Dog ramps look much more acceptable; however, this isn't the case with every dog and some actually avoid both ramps and steps no matter what. For more tips, you can watch our reviews of many different pet stairs and pay attention what we look for when picking the best dog steps, what cons and pros we've noticed with these products and what makes a good set of pet stairs. Here is one of the reviews. In conclusion, the main advantage of pet steps over dog ramps is that they are cheaper and far more mobile – you can place them almost anywhere, and won't have too much trouble storing them, whereas dog ramps are usually big and expensive. However, dog ramps are normally sturdier and simply a better option for dogs with arthritis or joint problems, as well as those who simply have a fear of pet stairs. We've already discussed the many advantages and disadvantages when comparing pet steps and dog ramps, which should give you a good idea of what you might want. Here are just a few more things you'll be glad you know about dog ramps as well. While there are many options of pet ramps for dogs to choose from, the major mistake many owners of senior dogs make is they forget to first of all consider their old dog's current health condition and any agility issues. Note: It's also necessary to get your older pet acclimated to using a dog ramp before he is beset with further visual or muscular difficulties. For example, if your Fido is elderly (11 years or older), it is likely that climbing any type of pet stairs of any size is, at this point in his life, physically uncomfortable. Owners with senior dogs may want to stop considering dog steps regardless of the lower price tag, and direct their sights toward a pet ramp for dogs to prevent any further health complications. Many pet owners agree that a dog ramp is the easiest and the most humane solution for pets that have become arthritic or disabled with age. Pet ramps are also advocated for dogs that are used to single-floor homes and have never liked or mastered using the stairs. Dog ramps should also be considered for canines recovering from an injury who would benefit from the straight walk up as opposed to lifting their legs over stairs. Special consideration needs to be made when selecting a proper ramp length. Obviously the higher the reach, the longer the dog ramp is required to be. As a result, the length of the ramp directly impacts how steep the slope or incline will be for your dog. Ramps are designed for both indoor and outdoor use (and some are made for both). You'll need to determine when and where the ramp will be used before shopping for one. Quick tip: Whether you're buying dog steps or a dog ramp, be sure to purchase a model with carpeting or some type of gripping material so your dog won't slip and fall. A pet ramp is usually considered tall if it is more than two feet high, while low ramps are generally about 1.5 feet high or lower. The wider the ramp, the easier it will be for your dog to balance and maneuver while climbing on it. Typical ramp widths are between 1 and 1.5 feet. Likewise, an easy slope is generally 18 degrees while a normal or medium slope rests at about 22 degrees. Climber slopes are generally 26-degree inclines and aren't used very often. Owners with miniature dog breeds should prioritize dog ramps over dog steps. The reason being is that very often these smaller breed dogs are too short for indoor pet steps and it would be considered a safety hazard if the dog needs to jump up or climb to get to the next stair. Essentially, it negates the whole purpose of pet stairs. Even a tumble from a height of 6 inches may cause a bad injury for these fragile little pups. 1. It can be stored easily, anywhere. You want a ramp that won't take up much space at home or in a car when not in use. Usually, most ramps will be folding (or telescopic models), but remember to confirm if that's actually the case. You don't want to be stuck with a giant dog ramp that cannot be folded. 2. It's lightweight and small enough. Another important aspect of a good ramp for dogs is how easily you're able to handle it. Ideally, you want something that's light and small enough so that you can put it together quickly whenever you need to. Ramps don't have to be miniature, but the smaller you can get, the easier it will be for you. 3. Its sturdiness and reliability. Even though you want a ramp that's lightweight, sturdiness and strength should also be there; it's no less important for you to have confidence in the product. You can judge good ramps for pets by looking at their weight capacity. Buy the one according to your pet's weight and triple check that. 4. It has a perfect surface. Many pet owners forget about the importance of grip when it comes to ramps. 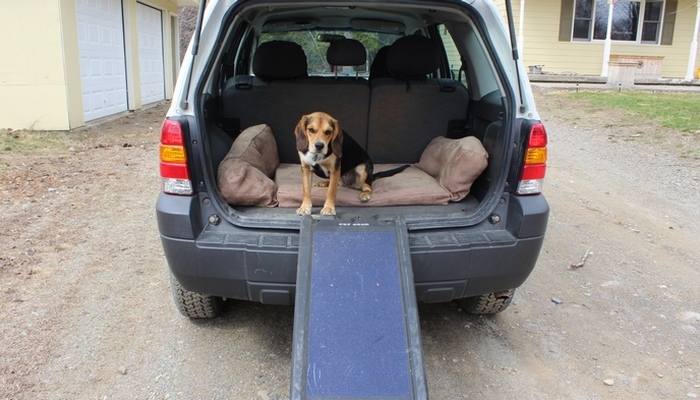 For those of you who are planning to use a ramp outdoors (and if you're using it with a vehicle, then that's most likely the case) – ensure a good surface where your dog won't slip when the ramp is wet. 5. Any safety precautions. Last but definitely not least is how safe your dog ramp will be. Front and rear stabilizers on ramps are the first things you must check ten times before starting to use the product actively. There are also non-skid feet that will ensure stability of the ramp. For even more safety precautions, you can choose ramps with side railings that stabilizes the ramp and prevent falls. To have a better idea what I'm talking about, I recommend you casually peruse some of the dog ramp best sellers on Amazon and read the product descriptions as well as other pet owners' reviews. Don't rush into buying anything but rather gather the information. dog steps/stairs vs dog ramps: which one to pick? There's a good reason why pet owners are often confused by whether dog ramps or dog steps/stairs are the best fit for their dog and their home. In general, either one will usually work for most dog related daily life activities, so it would be hard to make a terrible choice. You can narrow down your choices by noting that pet steps take up the least amount of space when in use and are often cheaper than dog ramps. Pet ramps are best suited for disabled pets or for geriatric dogs that lack strength in their rear legs, and they can take up less space when not used. Featured image courtesy of Animal Planet, originally published on their Amazon product page. Next articleDo You Tip Dog Groomers? Why and How Much? I have a ramp for my two Chihuahuas, and they love it! I guess it beats having to jump on/off the furniture!